How to query all posts or terms in a single loop within WordPress Multisite install. With working pagination. If you're familiar with WP_Query class, you will be stunningly surprised. Network_Query is its multisite analogue. // all WP_Query arguments are supported including meta_query, tax_query etc. $network_query = new Network_Query( $args ); // just like WP_Query! One search form. 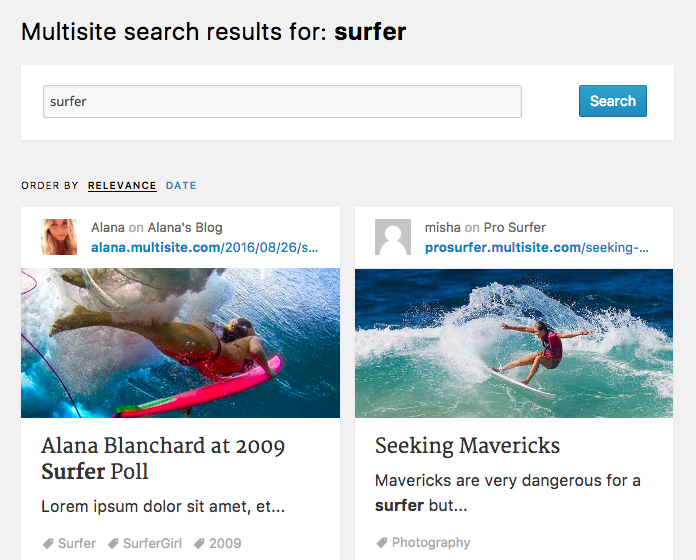 Multiple blogs search resuts. 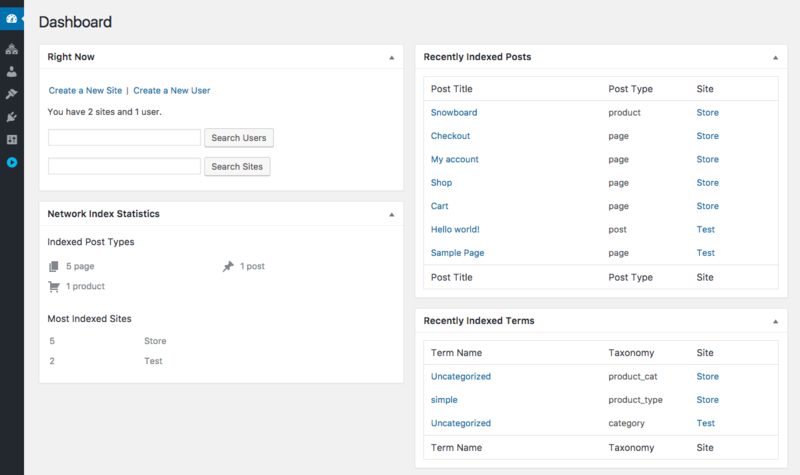 You can search for posts, pages, tags, categories, custom post types and taxonomies. Hundreds of blogs in your network? Not a problem — my plugin uses cron jobs to prevent server overload. I'm always here if you need my help. Please create a ticket if you need assistance with my plugins or contact me if you have a question. So, How to Get All Network Posts in a One Query? Click the links below to jump to a specific part of the documentation. This plugin will index all posts in your Multisite Install with custom fields meta_query and terms tax_query. The posts and terms index will be stored in the following database tables. Now some notes about the plugin installation. You can download the plugin by clicking the button in the top right part of the screen. By default this plugin will index only the new posts you publish. If you want to add to the index your old posts, go to Settings > Index and then switch to Rebuild Index tab. That’s where you can completely rebuild the index. One important thing to know — when you rebuild your global index, it may take a time — how much — depends on the size of your Network. Maybe 10 minutes or maybe an hour. You can find the index stats in your Network Dashboard. Let me introduce you the awesome Network_Query class — it works just like WP_Query but for all the network websites and supports all the same parameters + blog_id parameter (I will show how this parameter works in the next example). Now let’s begin with something simple. Something a little more interesting. In the loop we obtain $network_q->post object — it has all WP_Post object parameters with $network_q->post->BLOG_ID, the ID of the network blog. If you need to do something and the WP_Post object is not enough for your purposes, then use the switch_to_blog() function – it allows you run any WordPress loop functions like get_the_post_thumbnail(), get_permalink() etc. Just do not forget to pass a Post ID into these functions. We need restore_current_blog() to cancel the switch_to_blog() effect, the function switches us to the previous blog — so, use it in a loop. The network_reset_postdata() works similar to wp_reset_postdata(). The next very important feature of the plugin is the global search. And you can search all blogs not for only posts and pages (post types), you can also perform search for categories and post tags (taxonomies). Starting with the plugin version 4.4 it is even not required to do anything in the code in order to enable the global search. Just go to Settings > Index and then proceed to the Globals tab. If you use the Widget option, the Global Search Widget will appear in Appearance > Widgets, or if you would like to replace the default search results with the global ones, you should proceed to the Sites admin page and turn this feature on there for each site individually. 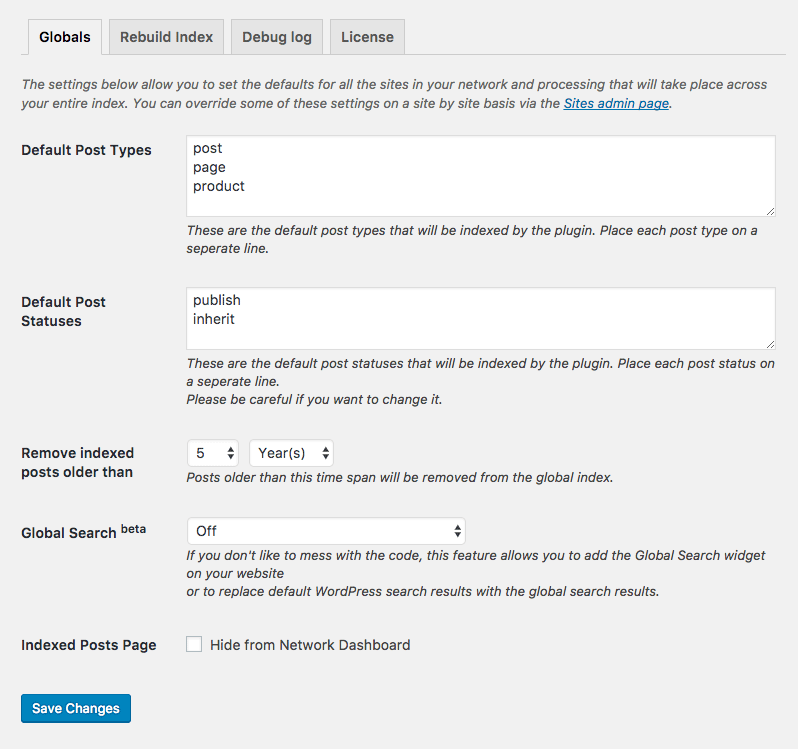 Use WordPress default search engine across the whole network. I mean s= parameter of the Network_Query class. Search for posts by their custom fields values — meta_query parameter of the Network_Query class. 'key'     => 'key1', // key1 must contain "wordcamp"
'key'     => 'key2', // OR key2 must contain "wordpress"
Search terms by part of their titles and descriptions. In full global search tutorial I will explain you each of the above examples and show how to replace default WordPress search form and results page with the global ones. Everything else is like in WP_Query. configure it in settings (globally for the whole network, or for each blog separately). (string|array) It is default WP_Query parameter and I suppose you should already know how it works. (int|array) This parameter allows to get posts from other blogs, just specify the IDs of the blogs you want to query posts from. Do not know where to get blog ID? Not a problem — my plugin will show a blog ID column in your network dashboard Sites > All sites. Plugin automatically adds the Blog ID column to the table with the all websites. And as I mentioned before, the post types for indexing can be configured individually for each network website. To do this, in your multisite dashboard go to Sites > All sites and click Configure link under the Indexing tab. 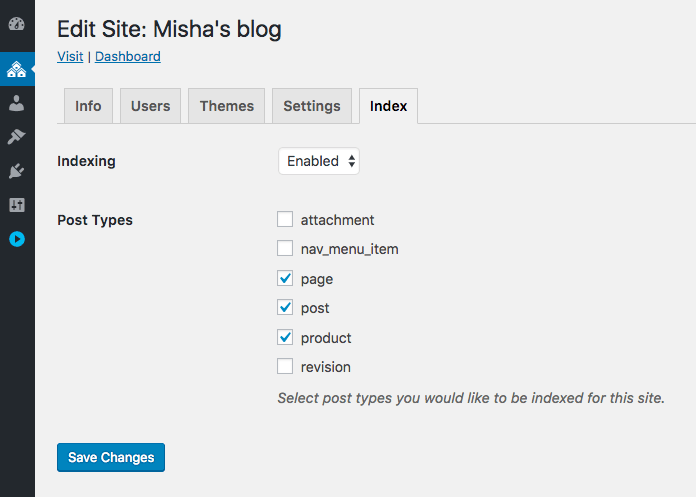 For each blog you can choose what post types to index or completely disable indexing. If you have problems with this example, you can read full detailed tutorial here. My plugin allows you to get not only post types but taxonomy terms as well. It can be implemented easily with network_get_terms() (click the link to view the detailed tutorial). Fixed: PHP Notice in plugin settings. Orderby parameter improved and now accepts array values. Added: Support of new syntax for ordering by specific clauses of a meta_query array. Improved: Individual website settings moved from the popup to a special page: All Sites > Edit > Index. 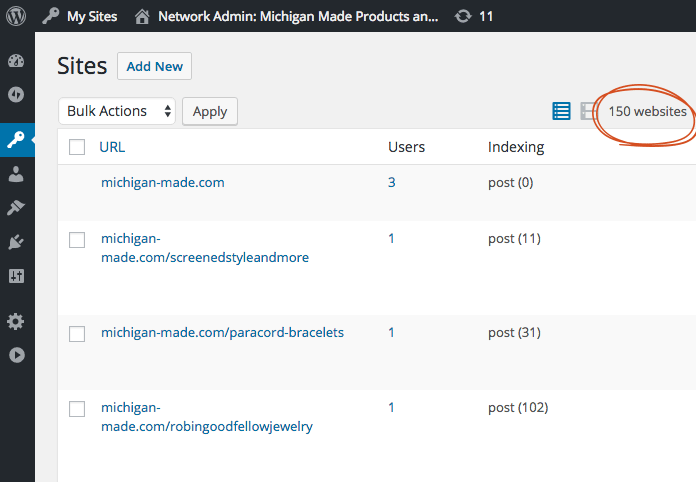 The index statistics has been moved from the plugin settings page to the Network Dashboard. Added: You can now hide in settings the page with all the multisite posts from your network admin area. Added: Blog ID column to the All Sites page. Improvements in plugin update mechanism. Small changes in plugin admin UI. Fixed: Polylang Pro bug when trying to get terms by language. Fixed: Problems with plugin auto updates. Added the link on the Plugins page that allows to refresh update transients (cache). Posts of any post type are now displayed on the Posts page in Network Dashboard. Added: Polylang support – you can get network terms with the network_get_translated_terms() function, which is very similar to get_terms() function except the 3rd argument where you can pass a language slug (example: en) or an array of language slugs. Added: Custom post statuses support. Added: Feature Images support in VC widget. Fixed: Bug with post type selection in Visual Composer element. Added: Visual Composer element that allows to display posts or pages from any blogs of your Network. Changes in plugin update mechanism. Added: You can now manage posts from all blogs in a centralized place in Network Dashboard. Added: network_get_term() function, the get_term() equivalent. The first parameter is $blog_id. 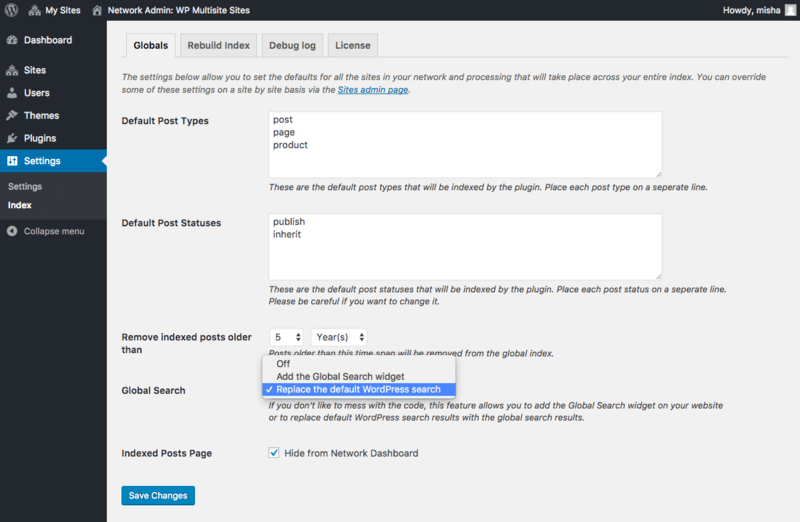 Now you can completely replace the website default search results with the global network search results in the plugin settings without code at all. As an option you can use both default and global search widgets in your website sidebar. Fixed: Warnings when indexing post meta. Improved: Plugin option pages are optimized for both new and old versions of WordPress. Improved: Plugin performance in /wp-admin/. Fixed: Problem with database tables, when default WordPress database has uncommon columns. Fixed: Problem when saving blog index settings caused by WP-Cirrus plugin. Now the blog_id parameter of Network_Query supports array values. Fixed redirect location for manual updates check. Code optimization and UI improvements. You can now get terms (categories, post_tags etc) from all blogs in Multisite network in a one loop using network_get_terms() function. @rudrastyh amazing multisite plugin and even better support- Christmas day reply from Misha the developer, thanks! The plugin is a one-time purchase which includes a license for plugin updates and support. To continue receiving updates & support after your license has expired you may renew.